Hobby restorer Student and web masters alike. with exploded views every nut bolt and washer listed. There is a super Archive of the Small Car Club Magazine. Bond Mini Cars, The Bond Bug. Reliant Mini Car Service. Not forgetting Two men from Texas a Great Gallery. Service manuals for Dynastart Sibia Villiers - Bosch Dynastart. question on the forums Answered here. the story its well worth it. 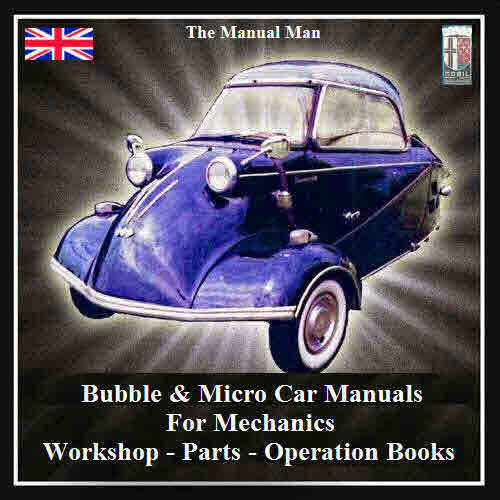 Simply the best Vintage Micro Car & Bubble Car manuals there is. Mechanics Archive - Auto Club Librery - Web Site information. Self Running DVD Pop in your PC drive and go. This file is sold by richo, an independent seller on Tradebit.